church as being a place of legalisms. As a result of legalism, the emphasis of the church is often a list of things that Christians "don't" do. Instead, we believe that Christ frees us to "live" life to its fullest. We believe in the Trinitarian God as Father, Son, and Holy Spirit. We also believe that the Bible is God's divine Word given to us for teaching, preaching, learning, and guidance for our lives. More importantly, the Bible continually demonstrates God's faithfulness, compassion, grace, and mercy to peoples of all generations: past, present, and future. Therefore, change in one's life comes from God the giver of life, not through the legalisms of the church. Casual dress is the norm at the Beaver Valley Church of God. One's spiritual condition is a matter of the heart. Put another way, our focus is not on the outward appearance of those who join in a time of worship. We focus on allowing the presence and power of God as Father, Son, and Holy Spirit to transform our lives. The worship gatherings offer a time of praise through music that includes both traditional and contemporary forms, the reading of Scripture, time in prayer, giving of our offerings, and a message about the life transforming power of God. Anderson, IN, we are also actively involved with Church of God Ministries of Western PA.
​ Jim & Patty Huselton have served as pastors of the Beaver Valley Church of God since October 1, 2000. They have three children: Jamey (Jen), Nikki (Tim), and Steven (Kelly), four granddaughters and two grandsons: Arabella, Allison, Junia & Anna; Alexander & Ace. Pastor Jim serves as Lead Pastor of the church. He has earned a B.S. in Music Education from Edinboro University of PA; a B.A. in Church Ministry from Warner University, Lake Wales, FL; and an M.A. in Theological Studies from Anderson University School of Theology, Anderson, IN. Pastor Jim has also served in various leadership roles in Western Pennsylvania Ministries of the Church God including; camp meeting music committee team member, camp meeting music committee team leader, and as a member of the WPA Ministry Church Health Team. Additionally, since February of 2012, he works as a site supervisor and is currently project manager for Habitat for Humanity of Beaver County. Pastor Jim is a devoted family man and enjoys spending time with Patty, their children and grandchildren. He also enjoys motorcycling, playing trumpet and guitar, and golf. Pastor Patty serves the church in the dual role of Worship and Counseling Pastor. She has earned a B.S. in Music Education from Edinboro University of PA; a B.A. in Church Ministry from Warner University, Lake Wales, FL; and an M.S. in Mental Health Counseling from Walden University, St. Paul, MN. Patty is the founder and operator of Visions of Grace Counseling Center which is located in the church. She also works as a legal advocate for the Women's Center of Beaver County working with those who have been victimized by domestic violence and sexual abuse. She has served on various teams in WPA State Ministries including, Credentialing Services Team as a member and team leader, and the camp meeting music committee. Patty has worked in a Counseling role with Not One More, a ministry developed to help families deal with the death of a loved one due to the heroine epidemic. This ministry also helps families who currently have a loved one dealing with heroine. Pastor Patty loves spending time with her family--especially her grandchildren. 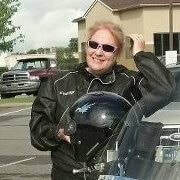 She also enjoys motorcycling with Jim. Their favorite vacation spot is the Smoky Mountains where there are several great motorcycle riding spots!